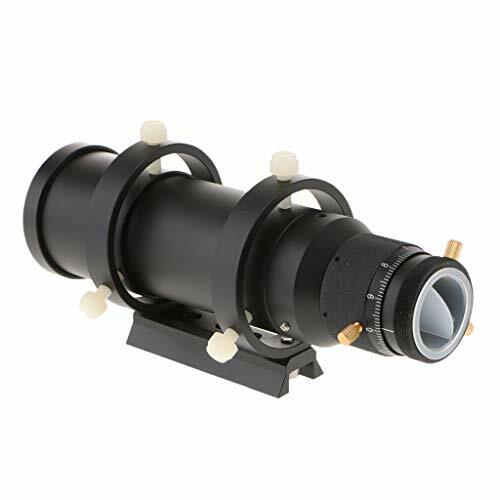 - 50mm guide scope double helical focuser with bracket designed for use with astrophotography telescopes. - Mini guide tube quickly find objects and guide stars for both visual and photography. - The double helical focuser with 10mm of stroke. - The main focus of the finder eyepiece is PL level. - Worm-gear focuser for rapid focusing, preventing the rotation of camera and eyepiece. - Double Helix Focus Stroke: 10mm/0.39"
- After the Free Stretch: 20mm/0.78"
50mm guide scope double helical focuser with bracket designed for use with astrophotography telescopes. Mini guide tube quickly find objects and guide stars for both visual and photography. The double helical focuser with 10mm of stroke. The main focus of the finder eyepiece is PL level. Worm-gear focuser for rapid focusing, preventing the rotation of camera and eyepiece. View More In Finder Scopes. Telrad Dew Shield+ for Telrad Finders.